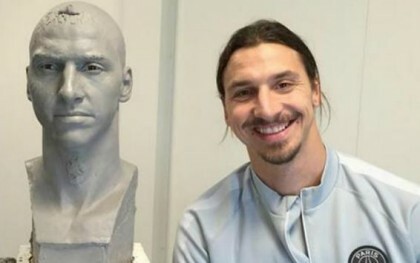 Zlatan Ibrahimovic has unveiled his boldest creation yet – a giant sculpture he is calling the “Statue of Zlatan”. The Swedish FA are building the statue to be erected outside the Friends Arena in the Swedish capital. It came after Ibrahimovic was crowned the country’s best player for a record 11th time. Zlatan Ibrahimović, who was born on the 3rd of October 1981, a Swedish professional footballer who plays as a striker for Manchester United. Primarily a striker, he is best known for his great heading ability, strength and immense shooting. He was also a member of the Sweden national team, making his senior international debut in 2001 and serving as captain from 2010 until he retired from international football in 2016. Ibrahimović began his career at Malmö FF in the late 1990s before being signed by Ajax, where he made a name for himself. He signed for Juventus and excelled in Serie A.
Ibrahimović scored both goals from penalty kicks in home win over Marseille to overtake Pauleta and become Paris Saint-Germain’s all-time leading goalscorer with 110 goals in all official competitions. Zlatan has already bagged 8 goals in the Premier League for Manchested United and more is expected to come.